“So when you give to the needy do not announce it with trumpets, as the hypocrites do in the synagogues and on the streets, to be honoured by others. Truly I tell you, they have received their reward fully”. 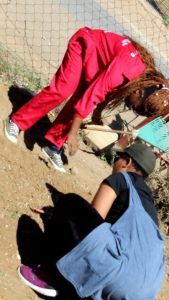 On the 15th of September 2018, under the heading: #SeasonOfCreation, the Anglican Students Federation, Free State region had a community outreach on National Clean-up Day. As one of the missions of ASF to taking care of the ones who are in need [having an outreach], is a priority. On that day service was provided, seeds were planted and indeed we created new life. ASF Free State region touched a life and transformed it. Hope and love was given, also a new atmosphere was created. Gold and silver we did not have, but with the hands GOD blessed us with, we did our part and touched weary heart.